This review of Godley’s life before joining the Treasury begins with a brief tour of his illustrious ancestors (including the founder of New Zealand’s Christchurch colony, a private secretary to William Gladstone who ruled India without going there and Oxford’s most widely quoted Latin orator). It follows him through a chaotic childhood and fierce boys school education to successful studies at Oxford, and the discovery of oboe skills which lead him via the Paris Conservatoire to a seemingly bright career in the BBC Welsh Orchestra. The London and Dublin arts scenes lead him to acquaintance with Lucian Freud and marriage to Kitty, who has recently divorced Freud. 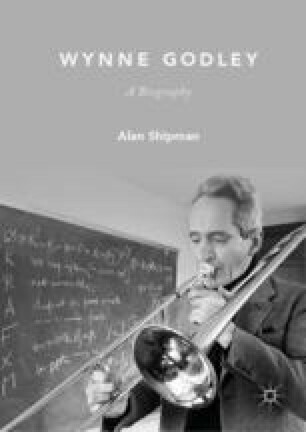 When stage fright stalls his orchestral career, Godley takes a more stable job in industry and, rediscovering an interest in the economics he studied at college, applies successfully for a post in the UK Treasury. Freud, A. (2015, June 27). Annie Freud Interview: Why I’ve Finally Embraced the Family Name, Interviewed by Susanna Rustin. The Guardian. Online at https://www.theguardian.com/books/2015/jun/27/annie-freud-interview-why-ive-finally-embraced-the-family-name.